Don’t take what people have to say about you seriously. Better still, don’t take yourself seriously either! The other day someone I know called me a scumbag (per an online dictionary that I referred to, it is a noun and means ‘a contemptible or objectionable person’; ‘someone with poor judgment and no class’) in a closed-group message thread. I smiled at the charge. And decided not to respond. Just three years ago, I had physically prevented this person from drinking and driving. He had then objected to me intruding on his privacy, personal preference (to drink and drive) and judgment (to know what is right for him). I had tried explaining to him that I only had his best interest in mind. But, in the same closed-group message thread, he had cried foul. Back then I was pained that I could not get him to see where I was coming from. I apologized for my behavior. But the matter never got resolved and, in fact, as he continues to see it, the “damage to our relationship is irrevocable”. But this time, when in another context, this person referred again to the three-year-old episode and called me a scumbag I was unperturbed. I was neither pained. Nor was I keen to avenge his sentiment. And here’s why I chose to be so: after all, this person had a right to his view – if he found what I had done to him contemptible and objectionable, if he had found my judgment poor and for all those reasons, if he perhaps found me lacking in class and not worthy of his association, he definitely was entitled to his opinion. In essence, the best and the only thing I could do was to respect it. Truly, the lesser importance you give to what others have to say about you, the more peaceful you will be. Developing this attitude need not mean that you must be thick-skinned, brazen and egotistic. It only means that you have learnt to respect an opinion which is divergent from yours, that you have stopped sweating the small stuff and that you realize the value in letting go and moving on! The reason why we want to avenge people’s uncharitable (per our view, not theirs!) sentiments with a how-dare-you is that we place undue importance on ourselves. A how-dare-you is nothing but your ego erupting and manifesting itself as anger and intolerance – often even as physical violence – towards whoever you are disagreeing with. Actually, you need not place so much importance on yourself. I have learnt this the hard way – from my own experience. There will be times in Life when people will not be willing to understand you or appreciate what you have to say. In such times, the best response is to not respond, not clarify, certainly not avenge and to simply let go and move on. You can never control what people say or do. You cannot make them understand you if all they want is to interpret what you say. Respect their right to have an opinion even if you disagree with the opinion. Forgive them if you can. If you can’t do either, just remember this: whether you are called a scumbag or a cheat, whether you are called a liar or an opportunist, at the end of the day, you know who you really are. As long as you are true to yourself, and are happy being who you are, don’t sweat over what others have to say! Sometimes in Life you may not want to have some conversations. You may want to run away from them. But don’t. It is through simple, honest, conversations, however difficult they may be, that you can attempt to resolve tricky situations or at least get things off your chest, leading you to peace. The reason why you want to avoid talking to some people is because you experience them differently. You don’t see them as being open, having integrity or matching up to your standards of thinking. First, know that it is absolutely fine to think the way you are thinking about people. You are normal. Now that you feel better, remember also that people are different the world over. Just as you are entitled to your opinion others are too. And if their opinion does not match yours, so be it. There is nothing tragic about a difference of opinion or perspective. Don’t dramatize the way you feel about it. Instead of conjuring up a non-existent emotional scenario in your mind, go out there and speak your mind. And if you don’t want to do it upfront, please join if the other party starts a conversation. Don’t react. Just state what you feel. Don’t intellectualize, don’t sermonize. Speak from the heart sincerely, without fearing how you will be interpreted. Give the situation and the person you speak to dignity. Know that you may not be able to generate a resolution but you would have moved in the right direction. You will feel better. And that’s the first and most important step to peace and joy. It is only from your inner joy that you can generate joy in your circle of influence, which includes the person(s) that you are trying to avoid just now. Conversations are not difficult to have. You make situations difficult by not having honest conversations! Develop an Is-That-So Attitude to steel yourself! 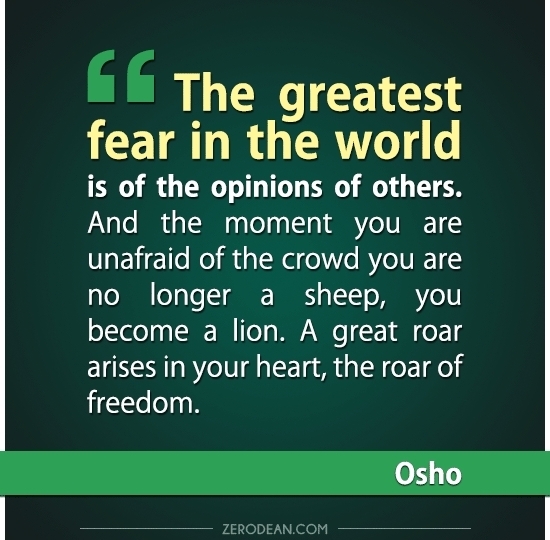 The easiest thing for anyone to do is to opinionate on what others do and how other people should live their lives. We are all guilty of making such opinions, passing such judgments, all the time. There’s a certain, call it sadistic if you like, joy that people derive in hurting others with their words. And there’s so much grief, therefore, that people carry within them, of memories of such wounding words, in their lifetimes. In order to avoid getting into either end of this hurt trap, it is very important to stay aware. The moment your mind rushes to judge someone, remind your mind that your opinion is perhaps both unsolicited and avoidable. Enquire whether what you are about to say is true or kind. 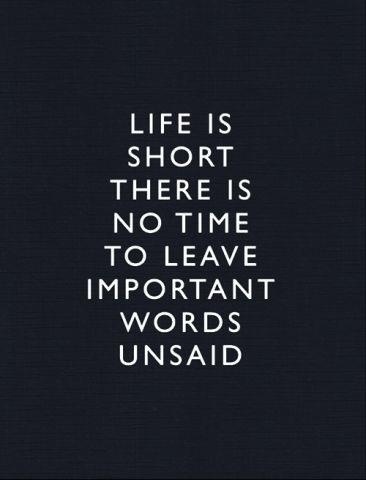 And only then, only if completely unavoidable, and totally true, say what you must, but say it kindly. If you can’t say it kindly, just don’t say it! Period. The other thumb-rule to follow is while you can have an opinion on someone, it is best when it is with you. For it is completely worthless when it is invested in someone who does not value it. So, in essence, all you need to do when people say or do something that hurts you is to ask, in complete, genuine bewilderment__because your sense of shock is really that__ “Is that so?”. I learned this through a Zen story I heard some years back. The Zen Master Hakuin Ekaku (1686-1768), one of the most influential figures of Japanese Zen Buddhism was revered by his neighbors as one living a pure life. A beautiful Japanese girl whose parents owned a food store lived near him. One fine day, the girl’s parents discovered that she was pregnant. This made her parents very angry. She initially would not confess who the man__who had got her pregnant__was. But after much forcing, she, at last, named Hakuin. Horrified, the shocked parents went to the Master, blamed him, berated and threatened him with dire consequences if he did not “own” their daughter’s child. “Is that so?,” was all that Hakuin said, smiling. After the child was born, it was brought to Hakuin. By this time he had lost his reputation, as people shunned him for his “immoral” conduct. The barbs from, and being ostracized by, the people did not trouble him at all though. Instead, he took very good care of the child. He obtained milk from some of his more forgiving and tolerant neighbors and provided for everything else the little one needed. A year later, the young girl could stand her own lie no longer. She told her parents the truth – that the real father of the child was a young man who worked in the local fish market. The mother and father of the girl were even more horrified this time. They at once went to Hakuin to ask his forgiveness, to apologize at length, and to get their grandchild back again. The moral for all us is to learn from Hakuin. Let us learn to be just witnesses of whatever happens to us in Life. Including being witnesses to judgments and opinions being pronounced in favor or against us. In fact, that’s what we really are __ mere observers. In joy or in sorrow let us not get attached to the events, people, circumstances, opinions and judgments of, and in, our lives. Let’s develop an Is-That-So attitude to steel ourselves in Life. This, and this approach alone, can guarantee us the inner peace that we all crave for, work hard for, but never really manage to find. Author AVIS ViswanathanPosted on May 9, 2013 March 14, 2016 Categories Art of Living, Don't Judge, Hakuin Ekaku, http://schemas.google.com/blogger/2008/kind#post, hurt, Inner Peace, Intelligent Living, Japanese, Opinion, ZenLeave a comment on Develop an Is-That-So Attitude to steel yourself! Don’t criticize and don’t worry about being criticized either! Everyone has an opinion about everything. And everyone loves to offer it whether it is asked for, needed, or not. Some of that opinion is often critical. Again, everybody loves to criticize others. And they do it all the time! It’s so interesting. And often downright funny. If you just watch the social media space, for instance, everyone has an opinion on how the country must be done. Every action of public figures __ politicians, bureaucrats, movie stars, sportspeople __ is criticized and rubbished. You and I are as guilty of indulging in, and are not spared from it either, criticism. Just review the past 24 hours. Think of all that you said. And in some way you may have criticized or offered an opinion on something or the other in your circle of influence. Maybe you may have posted something on your facebook page criticizing a movie or a politician. Or you may have sworn at an unruly driver on the street and criticized the lack of traffic sense among people. The one curious thing about criticism is that it always sounds right and justified when you use it on someone else. But when you are criticized you often grieve. This happens everywhere __ in our homes, at workplaces, among friends, in social circles, on a plane, even at a funeral! Criticism can surely debilitate you__leaving you wondering why people are being so mean and are unwilling to understand you. Yet when you receive criticism, it is a great opportunity to cleanse yourself. When you are, or anything you have done is, ridiculed, questioned and rubbished, through your pain you can awaken to an awareness that can transform you. Your grief, the way you feel at the time that you are being criticized, gives you the opportunity to understand the value of being compassionate and appreciative of others’ efforts and opinions. In order to appreciate this better, first understand why you__or I__ criticize in the first place. Criticism is, fundamentally, an ego game. It is your mind urging you to consider yourself superior to another person. It is also a reaction borne out of fear. Because the act of criticizing is older than you are! So, you have been criticized even before you came to terms with the ways of the world. Your criticism, of others, is often, therefore, in self-defence. You criticize because you find it, obviously, more rewarding than being criticized! The best way to deal with criticism is the way you would deal with hot candle wax. First allow it to dry up. It is a lot easier to discard it and get it out of your system when it has become cold and stale. 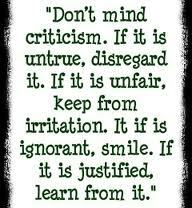 Understand also that criticism is just a review about an event or action that is over, past, dead and done away with. In the now, in the present, there is no issue. 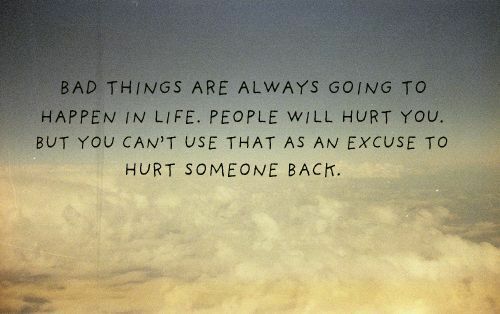 So, learn to let go and move on than dwelling in the past! Second, appreciate where the person who is critical of your actions is coming from. Even if the person is unjustified, rude, violent or cruel, understand that that person has a right to her or his view. It belongs to that person and does not belong to you __ even if it is about you. Train your mind to respond with an exclamation__from awe, from wonder, from amazement__ that says “Is that so?” instead of responding with anger and violence while asking “How dare you?” Know that when you, even if it is only in your mind, question the other person’s right to opinionate, criticize, it is really your ego which is leading you. Refuse to follow. Turn your attention away. Learn to treat the whole experience like a game. Tell yourself: “Hey! Watch out! This situation, this comment, this person is provoking me. And my mind is urging me to fall prey, to succumb. Let me escape!” And each time you win, punch your fist up like a champion will. When you do succumb, do get dragged into the situation and when you emerge from it bruised and grieving, remind yourself to not fall prey again. Like with all other games you have learned in Life, you get better and better at dealing with criticism with practice. Then, over a period of time, you will have mastered the art of being unmoved. All criticism, then, will just fall off you. Like water falls off a duck’s back! Celebrate your critics too. They are the ones who will tell you things which no one else will. Not all criticism is unfair or unjustified. There’s value in everything. Focus on the message and not on the messenger. On what is being said and not on who is saying it or why the person should not be saying it! Again, you don’t need to always agree with what’s being said. But you can at least reflect on it. And if you see value, incorporate the learning or input, to make you, or whatever you are doing, better. Whatever you do, whether you welcome criticism or reject it, learn to be both miserly with your own views of others and to be unaffected by their views of you! It’s a beautiful way to cut your giant ego to size. And an even more wonderful way to celebrate the mystical diversity of thought that thrives in the oneness of all creation! Author AVIS ViswanathanPosted on January 28, 2013 March 14, 2016 Categories Art of Living, Ego, Game, How Dare You?, http://schemas.google.com/blogger/2008/kind#post, Ignore, Intelligent Living, Is that so?, Opinion, Unmoved, ViewsLeave a comment on Don’t criticize and don’t worry about being criticized either!